Acronis Backup & Recovery 12.5 Advanced Server Upgrade Coupon 33% Off - hard drive backup and recovery software for servers, read review. When you start installing the software you have several choices how to use the machine you run the installation file on. - Backup this machine�s data. Only Acronis management console and agent will be installed. Agents are software which performs all backup and recovery operations on remote or local computers, in our example it will be installed on the same computer with management console. Acronis management console is the core interface which allows you remotely connect to all network computers with agents installed and perform backup and restore operation. - Centrally monitor and configure the backing up of physical and virtual machines. You install management console and management server on the same machine. Acronis Management Server allows you to configure several remote machines simultaneously, for example you can create a backup plan for several computers. - Store the backups of other machines on this machine. Install only storage node on this machine. Acronis Backup and Recovery 11 Advanced Server Storage Node is a special backup location which makes backup configuration easier. - Connect to remote machines. Install only management console on the machine. As you can see on the screenshot I have selected first two checkboxes and to tell the truth I had very bad experience installing management console, management server and the agent on the same machine. While installing Acronis Backup and Recovery 11 Advanced Server components my system showed blue screen and rebooted. Every reboot showed me blue screen again and again. Note the build number was 11.0.17318, my operating system was Windows XP SP2 and located on VMWare Workstation. First I thought management server can�t be installed on Winodws XP SP2, but I checked Acronis KB and found the following article Windows XP SP2 is fully supported so the issue may be deeper, perhaps incompatibility of two components. What�s new in Acronis Backup and Recovery 11 Advanced Server in comparison with Acronis Backup and Recovery 10 Advanced Server? 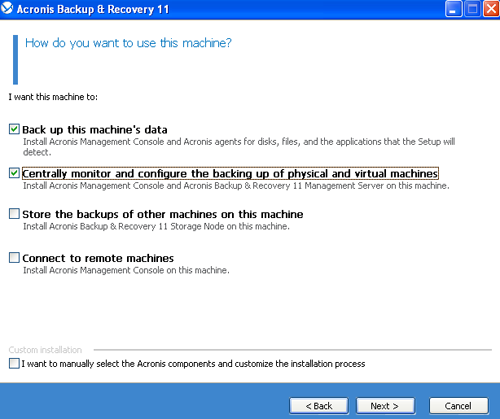 As I have chosen to install management console and the agent during the installation I had two option on desktop, one was Acronis Backup and Recovery 11, which was management console (screenshot above) and the second option was Manage Local Machine. The main window of the program (in manage local machine) is pretty much the same as in Acronis Backup and Recovery 11 Server for Windows or Advanced Workstation. The main difference between local and advanced versions of Backup and Recover 11 is ability to manage remote computers, tape drives support and management. - Create backup plan. You choose the source of the backup data (full drive, partition, file or folder), the destination place for the backup (the following storage media is supported: centralized and personal vaults, local folders on the same computer, network computers, FTP and SFTP servers, storage nodes and tape devices), then you may schedule the backup creation and finally choose backup options such as backup split, compression level, use sector-by-sector backup, use VSS (volume shadow copy), use fast differential or incremental backup, configure error handling and much more. - Vaults. Actions -> Create personal vaults. A vault is just a backup location you create for the backup archives and images storage. 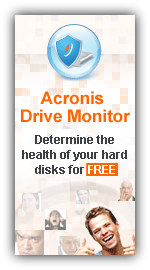 It is not necessary to store backups in it but Acronis advice you to do so, eg. it would be much easier to find the backup inside the vault than on local drive or any other supported storage media. Vaults are shown on the left pan of the main program window and contains all backups and images you have created, so it is just convenient to use vaults. - Acronis Secure Zone. Actions -> Create Acronis Secure Zone (ASZ). A special hidden partition on a local drive to store backups and images. - Create bootable media. Tools -> Create bootable media. You can use a flash drive or CD/DVD discs to save Acronis bootable components on them, so in case of system crash you boot your computer from this bootable media and restore the system from the image. Note that if you want to recover the system to a different hardware you should install Acronis Universal Restore first and then create Acronis bootable media. See Acronis Universal Restore review for more information. - Disk management. Using Acronis Disk Director Lite you can perform the following operations with the hard drive: create, delete volume, clone disk, convert MBR to GPT (vice versa) and other operations. Acronis Backup and Recovery 11 Advanced Server is an excellent backup solution for remote management of workstations and servers. Provides both local machine and remote computers management with the ability of hard disks manage. User interface is very easy to use, you don�t have any special knowledge in order to understand the software functionality. It is a fact that big companies use from 2 to 6 backup recovery solutions simultaneously to protect their servers and workstations, I believe that Backup and Recovery 11 Advanced Server can be the only backup and restore solution.